Respected speech-language pathologist Sherry Artemenko announces her Top 10 PAL product lists by type and category representing the only industry recognition focused on encouraging language development through great play. Parents and educators value Sherry’s 35 years of experience, seeking advice through her popular blog, playonwords.com, private practice, media appearances and articles. Regular interaction with children guides Playonwords founder, Sherry Artemenko, to a unique set of the best toys, games, books and apps that have the chemistry to develop language while delivering great play. 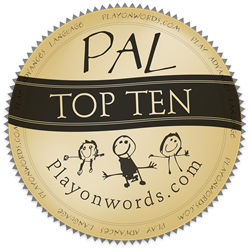 Today, Playonwords is announcing the “Top 10 PAL Picks of 2016” by age and product category. Our Top 10's take the guesswork out of gift giving for the holidays. Parents and grandparents are using our list to shop for smart toys with lasting play value. Each product has been assessed and reviewed by Sherry with input from parents, kids and educators. Observing play in action, combined with her critical eye for language potential, Sherry awards products and writes insightful reviews offering practical tips on how to maximize the educational value in each winner on playonwords.com. Language catalyzing PAL winning toys and games are powerful additions to a child's learning tool box, since children learn through play, and language is integral to learning! Our 2016 Top 10's include a number of great winners that inspire physical building to match rigor in story planning, creation, revision and presentation. Whether constructing the “Wonderhood Grand Hotel” or K’NEX’s "Mighty Makers Director’s Cut" stage, kids are positioned to strengthen cognitive foundations for reading, writing and overall literacy. Also enhanced are skill sets related to vocabulary, memory, association, deductive reasoning, prediction, dialogue, narration and emotional IQ, through games that encourage language like "Wonder Forge’s Dr. Seuss Thing Two Thing One Whirly Fun Game," EQtainments’ "Q’s Race to the Top" or Tiggly’s “Tiggly Shape’s Got Talent." Sherry’s expertise has been tapped by NBC Connecticut TV, FOX TV News 6 Milwaukee, Parents Magazine, The Chicago Tribune, San Francisco Chronicle, parents.com, parenting.com, mom.me, ASHAsphere (official blog of the American Speech Language Hearing Association), and ASHA LEADER magazine. For Sherry, great play is not just about fun, or language development, it’s about going deep on both. Her expertise has been built on science and more than 17,000 hours of client experience. Each set of Top 10’s represents a breadth of themes and genres, but they all have one thing in common - they are trusted lists of fun products that boost learning through play. Fire Station Train Set by Bigjigs Toys Ltd.
Each holiday season, millions are spent on kids’ toys, games and books. These PAL winners above are not only great fun but also encourage rich language development. Think “tastes like ice cream, fortifies like spinach,” optimizing your toy purchases to build language while maintaining all the fun. Now’s the time to be intentional about your child’s toy chest, game drawer, bookshelf and tablet! Playonwords.com was founded by well-respected speech-language pathologist, Sherry Artemenko. Her 35 years championing language rich play, esteemed PAL Award, popular blog, and insightful tips to parents set her apart as the leading advocate for the language component in toys. Sherry established the PAL Award to identify unique toys, games and books that through their design, quality and character, encourage play that advances language. PAL winners in the hands of kids, spark fun and creative play with lots of talk. Such toys, recognized on the basis of her child development expertise, are complemented by practical coaching in her blog, showing parents and caregivers how to get the most from toys, games and books to build language and underlying cognitive skills.